In 1897, Bram Stoker penned his gothic novel Dracula and popularized the modern vampire myth with the introduction of Count Dracula. But the discovery of manuscripts dating back to medieval England suggest the belief that the dead could rise from the grave originated during a much earlier era. These accounts were written hundreds of years before Stoker created his nocturnal creature, long before the Eastern European legends gained popularity. Secrets of the Dead: Vampire Legend, airing Tuesday, October 27 at 9 p.m. on PBS (check local listings), brings together scientists, historians, archeologists, a real-life modern day vampire slayer, and the great-grandnephew of Bram Stoker to examine if the origin of the vampire lore lies in fact rather than fiction.Vampire Legend opens Season 15 of Secrets of the Dead. 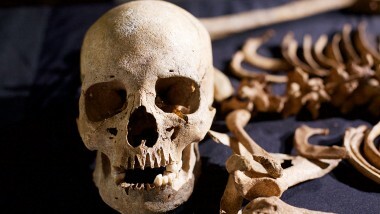 Archaeologist Dominic Powlesland has excavated more than 10 deviant burials from Anglo-Saxon graveyards that provide more evidence of belief in vampires. Some of the bodies were buried face down in positions that would be unnatural for a normal burial. 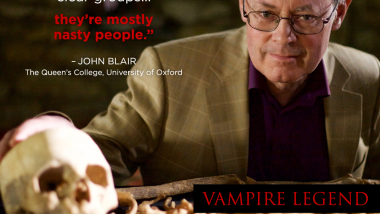 According to Blair, “…what’s remarkable about this group is that you can virtually see all the ways of keeping a dead person in their grave.” Medieval belief in vampires helps explain the discovery of deviant burials with decapitated skeletons and twisted limbs. But does the terror of the vampire exist today? To answer that question, Vampire Legend travels to Romania to investigate a story that made headlines in 2004. A 26-year-old woman in a remote village complained of a mysterious illness and claimed her uncle, who had died three months earlier, was visiting her at night and drinking blood from her heart. Believing the woman, six men from the village—including modern-day vampire slayer Mirca Mitrica—dig up the body to perform a vampire-slaying ritual and cure her. For the first time publicly, Mitrica gives his account of the vampire-slaying ritual, one which closely resembles rituals depicted by the medieval texts. 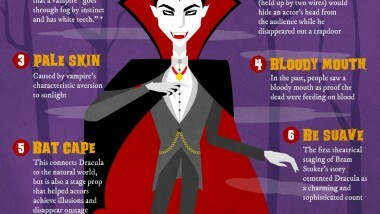 As the documentary suggests, at the heart of vampire stories is the terror of the unknown, disease and illnesses. Dacre Stoker, great-grandnephew of Bram Stoker, has studied how Bram shaped his vampire character. In Bram’s notes for Dracula, Dacre found an article about a serious vampire scare in the early 1900s in New England, which turned out to be tuberculosis. Nevertheless, believing the disease was vampirism, state forensic authorities allowed exhumations from the grave for people to perform various ceremonial practices to get rid of the vampires. Today, science can explain the signs of vampirism described in medieval folklore, as well as the modern Romanian account. Yet there is still a fascination with vampires and, for some, a primeval fear of the bloodsuckers. “Bram’s vampires and all the others today are for entertainment purposes,” says Dacre. “But you’ve got to realize where these came from. The myth of the vampire really terrorized villages.” If one believes the vampire slayer Mitrica, it is not the myth that terrorizes, but the vampire. Secrets of the Dead: Vampire Legend is a production of Icon Films in association with THIRTEEN Productions LLC for WNET and Channel 4. Narrator is Jay O. Sanders. Executive producers for Icon Films are Harry Marshall and Owen Gay. Directors are Kate Thomas-Couth, Toby Fenn and Nick Head. Executive in charge for WNET is Stephen Segaller. Executive producer for WNET is Steve Burns. Supervising producer for WNET is Stephanie Carter.